I've decided that I want to schedule a few weekly posts on my blog. I am going to start today with my first scheduled weekly post.....Drum roll please.....It's time for Friday Five. What is Friday Five? Each week, on Friday of course, I am going to post about five awesome things I have learned about or seen during the week. Sometimes it may be things I have learned about at school. Other times it may be things I learned about in blogland. This week they will be from blogland since school is out for the summer. 1. I learned a fantastic tip for getting the kids to give you their undivided attention thanks to Mrs. Miner's Kindergarten. She has her kiddos make monky faces. Too cute! How much would the kids love this? As she points out the kids can't talk with their cheeks puffed out or touch things while pulling their ears out. Love it! 2. Do you make paper dice and other paper cubes? I love all the things you can do with paper cubes, but I hate the cutting, folding the flaps, glueing/taping, and trying to get it all to line up just right. Do you feel the same way? If so, you are going to love this tip from Simply 2nd Resources﻿. 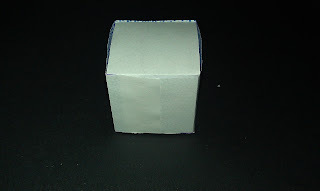 She shows you how to simply turn plain envelopes into super simple cubes. You might be wondering what you would use them for? I think they would be perfect for book reports, dice, cubing activities, and so much more. 3. Each year I wonder what I can do to celebrate and recognize all the hard work and growth of my students. I also wonder what I can give them and the parents. I have been toying with the idea of doing some scrapbook pages of my students for a while, but I wasn't sure how to put it all together without going broke. Then I saw a post by Live, Love, Laugh Everyday with this adorable idea. It couldn't be any cuter. Well, as cute as this is and as awesome as the instructions at Live, Love, Laugh Everyday are, I was wondering if I could pull off the organizational aspect of this & how I could make it easier. Then I saw a fabulous post by The Alphabet Garden about how to do most of the prep work ahead of time and streamline the process of making student scrapbooks. I am also toying with the idea of making digital scrapbook pages with a spot for a handprint and a spot for a picture. That way I could make it once, print it for each kid, and then just add the handprint and photo to it. 4. I am loving blogging and really wanted to dress up the site a little, but I am also totally new to blogging and didn't know how. Then I found Ladybug Teaching Files. Kristen has been sharing a series of 5 minute video tutorials on all sorts of interesting blog tips. I used her tutorial to add that cute little pink speech bubble to my comment box. If you are new to blogging, I highly recommending visiting her site. 5.The last thing I learned this week makes me smile and also makes my head spin with thoughts of all the things I can now do. Do you love YouTube? Is it blocked at your school? Have you ever found amazing content at YouTube that you thought would be wonderful for your students if only you could show it to them and avoid all the trashy stuff you don't want them to access. Now you can. Swamp Frog First Graders shared Zamzar, which is a super simple way to convert the videos on YouTube into files that can be stored on a flashdrive or CD and played on the computer at school. I hope you found the first edition of Friday Five useful. Let me know if you did & of course if you are new to my blog I would love to have you as a follower. Also, I am planning the following weekly posts.Please come back & check them out. Thanks for the blog shout out! It blew my mind to learn how to make those cubes. Thanks for sharing!!!! Thank you Mrs. Morris for the idea & I am glad you liked it Mrs. Kincaid. I did a digital scrapbook this year...LOTS of work, but they turned out SO adorable! I will post about it soon. I'll be sure to check out your post. Oh my word, I just stumbled on this and found a picture of my cutie pie monkey! Thanks for the shout out! Great idea for a regular blog post!